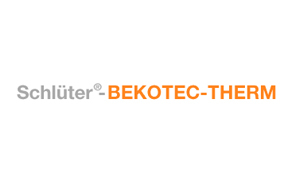 With the integrated system Schlüter-BEKOTEC-THERM we have developed a type of underfloor heating, low thickness that guarantees timely floors without cracks. It is a floor heating that consists of load-bearing panels Schlüter-BEKOTEC-EN, which can be laid directly on the slab or on the heat insulation and soundproofing commercially available, and a sheath isolating, called Schlüter-DITRA. The combined use of these two products allows to realize a screed of reduced thickness, just 8 mm above the reliefs of the panel, to avoid the transfer to the floor of the underlying tensions and to react quickly to changes in temperature due to its low thermal inertia.